The fact that managers make a marked difference in a club’s future is a proven reality. But the extent to which they can revive and rejuvenate a club is often undermined, if not ignored. 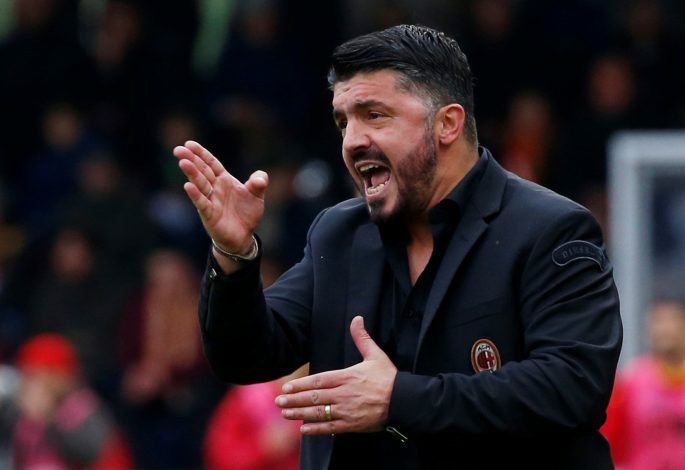 However, a storm that has taken hold of the Serie A hasn’t been sidelined, and much limelight has been given to the engineer of this hopeful comeback – Gennaro Gattuso. The club legend and playmaker took over the reins of the Rossoneri on November 27, 2017, from sacked Vincenzo Montella. Despite having been in charge of the club’s youth cadre prior, not much was expected of him to reverse the fortunes of a club whose glory days seemed to be well in the past. One couldn’t have been more wrong. In the 19 matches that he has been in charge of the side, a staggering 12 victories have been secured, with just 4 draws and 3 losses to their name. For a club that spent a scary period of their season in the bottom half of the table, the current win rate of 61% marks an improvement that appears almost magical. 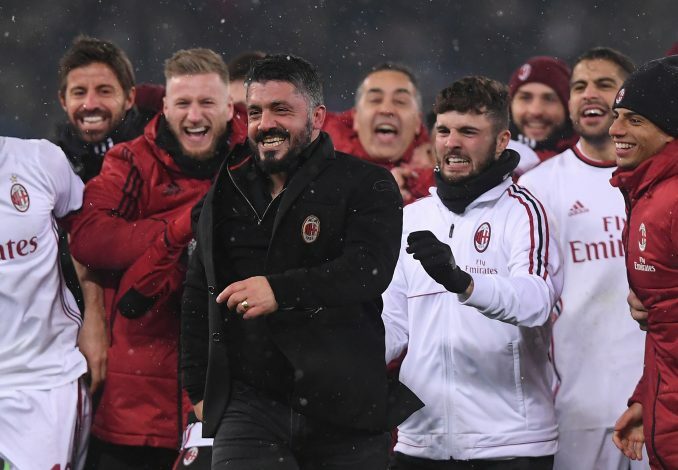 But there are key reasons as to why Milan under Gattuso has been doing so well and why, if given the right resources and kept for the long run, their long-awaited return to the elite of European football can be very much achieved. Gattuso’s predecessor’s main criticism was his failure to land a working and consistent formation for his side despite the large sum of money splashed under the new ownership. This appears to have been greatly amended under the club legend. This didn’t arrive without its own experiments and failures, however. A formation of three men at the back was briefly experimented with, but it failed to show any positive results. In their last group Europa League encounter against Rijeka, a 3-5-2 was seen in effect, but lacked the brilliance, and the match predictably ended with a 2-0 loss to Milan. Since then, he seems to have found the perfect formation in 4-3-3 – a lineup style that seems staple for any form of lasting success in Europe. 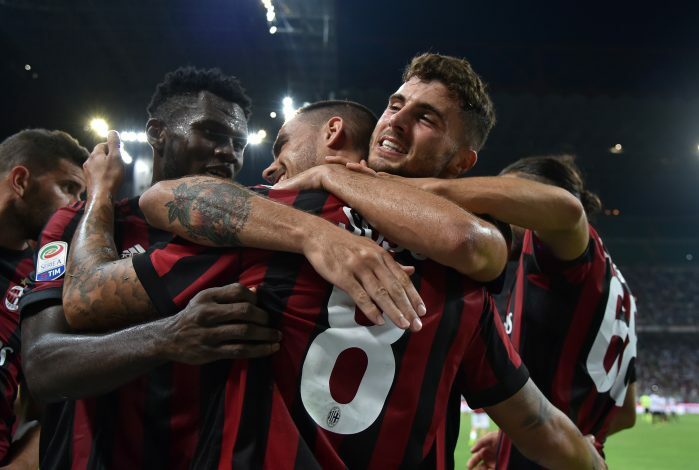 Its effectiveness is there for all to see – Milan have been unbeaten in 2018, despite facing the likes of Roma, Lazio, and Sampdoria in their recent games. The renewed formation enables a more fluid style of football, one that enables them to function in a style that prefers to lie in deep once a secure lead is established. This was there for all to see during the game against Roma, which ended 2-0. Once the opener was scored, the midfield and defense coupled with a brilliance that has not been seen in the outfit perhaps since the dying glory days of 2011. As a direct result of the compact lineup, Roma were barely allowed to let in 3 shots on target. A player that repeatedly shines with brilliance under the new leadership is Cutrone. At 20 years of age, the starlet has already led the club faithful to place all their hopes upon him for a long-term revival of their hallowed greatness. Since Gattuso has taken over, 8 goals have been found by the Italian, with 5 coming in just the last 7 games. What is of more importance is how utterly captivating he has been to the crowds, and apart from being a striker, the starlet manages to find an involvement in the game, particularly with his knack of being in the right place at the right time. While Gattuso isn’t known to be the warmest of managers, this might work to the youngster’s benefit in terms of overall development. Despite being their top goalscorer, his manager keeps stressing how he needs to tidy up his game and perform even better. The very team in question has seen a tactical order restored to it by the box-to-box midfielder. Apart from their distinct defensive tendencies through deep pressing, the side is seen with just a lone roaming striker, and is more reliant on the rest of their performance. While this takes away greatly from their attacking abilities, the balance it creates in the rest of the side is often more than enough. Using this, all they need to do is to find an opening goal and then stick to their method till the final whistle, as they have done to remarkable success against Sampdoria, where they won 1-0, and against Lazio too, where the final scoreline stood 2-1. A rare departure from this came in the 4-0 win over SPAL in early February, where their four goals came through 20 shots – a rare attacking flair. Lastly, going back to the Roma game, it is important to understand the history of the goalscorers. Both Cutrone and Calabria are youth graduates of the side, and this is a feature that one can hope to see more often if he is given the job for the long term, particularly considering his past gig as the head coach of AC Milan Primavera. With the side now in the finals of the Coppa Italia and set to face Juventus, that is still a piece of silverware they can attain this season. Further, with the derby against Inter looming ever closer, a Champions League qualification spot seems more and more likely under Rino’s leadership. And still a possible reality is the UEFA Europa League trophy, with their next opponents, Arsenal, not looking the part of champions. All in all, to assume anything incredible solely from a small sample space of success at this point will be pompous and not right. However, the right vibes seem to be rolling in Milan, and perhaps hiring the legend is the finest decision the club has made in an attempt to recover from the shambles that saw them hit near rock bottom in 2014, when they ended the season in the 10th spot – a historic low. Does hope remain?